In each of our lives Jesus comes as the Bread of Life–to be eaten, to be consumed by us. This is how He loves us. 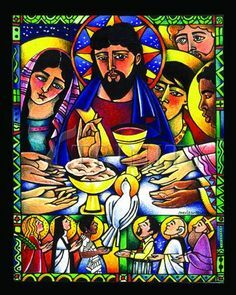 Then Jesus comes in our human life as the hungry one, the other, hoping to be fed with the Bread of our life, our hearts by loving, and our hands by serving. In loving and serving, we prove that we have been created in the likeness of God, for God is Love and when we love we are like God. –Blessed Mother Teresa of Calcutta, “Jesus Christ: He Wants to Love With Our Hearts and Serve With Our Hands,” 1997.